During the Age of Discovery, Portugal’s largest cities are prospering: Besides Porto and Lisbon this is notably true for the city of Coimbra with its famous university. As the head of one of Coimbra’s old-established houses, you sense that the city’s growing wealth also enhances the feeling of insecurity among its citizens. So you employ your own legion of security guards to offer protective services to the city’s most influential scholars, council members, merchants, and clerics. After all, you want to cinch favors from some of them and not all can be convinced with money. There are many ways to victory. But whether you focus on increasing your financial income, recruiting new guards, fostering the academic progress, furthering your relations to the surrounding monasteries or endowing the voyages of this era - in the end, you will only be victorious if you perceive and use the ever changing synergies that each new game provides. On top of that, the suspense-packed struggle for Coimbra’s most helpful citizens is ensured by a special dice drafting and dice placement mechanism in which each chosen die does not only affect the order of play and the height of your bribing cost but also determines which kind of income you will later receive. 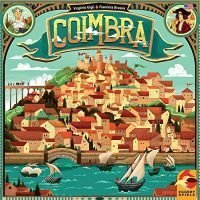 Add a Review for "Coimbra"